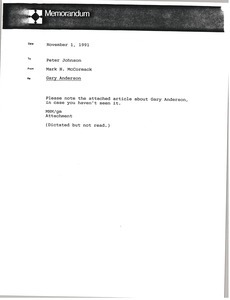 McCormack sends an article about Tampa Bay Buccaneers running back Gary Anderson from the October 26, 1991 edition of the Orlando Sentinel. Enclosure not scanned. 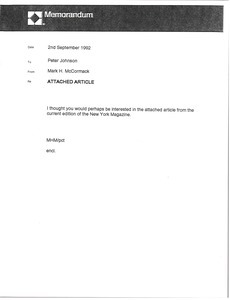 McCormack sends an article from the September 30, 1991 issue of New York Magazine regarding baseball player Mickey Mantle. Enclosure not scanned. 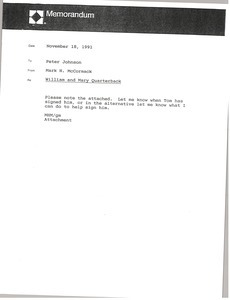 McCormack sends an article about College of William and Mary football quarterback Chris Hakel. Enclosure not scanned. 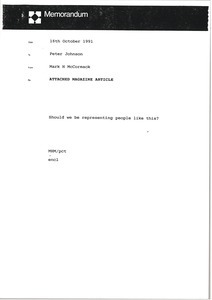 McCormack sends an article from New York Magazine on how to survive getting fired from a job. Enclosure not scanned. 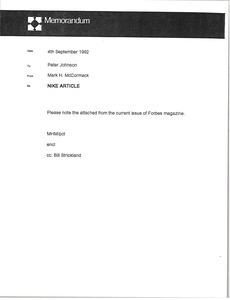 McCormack sends an article from the current issue of Forbes Magazine regarding Nike advertising and getting into the sports agent business. Enclosure not scanned.